In this article I wanted to share my summary and thoughts about FreedomPop. 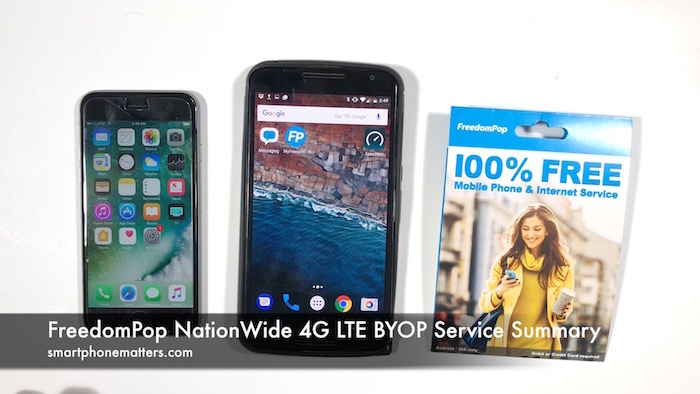 I ordered my FreedomPop NationWide 4G LTE SIM kit and signed up for the free trial of their $20 Premium 1GB LTE Unlimited plan. That includes unlimited talk and text plus 1GB of high speed data. FreedomPop also offers a free Basic LTE 200 plan. This FreedomPop SIM uses the AT&T LTE network. Now FreedomPop offers other plans and services on the T-Mobile and Sprint networks and they also have another global SIM card, but I am only discussing what I signed up for. I like FreedomPop, I think its an innovative idea. They offer both free and premium plans. But there are some things you really need to know and understand to decide if FreedomPop is right for you. I tried the service with both my iPhone 6s and Nexus 6 (Android). The most important thing to understand about FreedomPop is that you need to use the FreedomPop app for phone calls and text messages. You cannot use your phone’s built in phone or messaging app. This means you may not be able use your phone the way you are accustomed to. With my iPhone 6s, I quickly learned that the SIM card only has cellular data. You must use install and use the FreedomPop app to place and receive phone calls and well as send and receive SMS text messages or MMS picture messages. You cannot use the iPhone’s built in Phone app for calls. You also cannot use the Messages app for SMS and MMS, although it will work with Apple’s iMessage but maybe not the way you want to use it. FreedomPop provides your voice and messages through the FreedomPop app, which uses your internet connection. That’s your WiFi or cellular data service. I like the fact that they have both Free and affordable monthly Premium Plans. The $20 Premium 1GB LTE Unlimited plan is a good value. They also offer the Basic 200 LTE plan that comes with 200 minutes, 500 messages, and 200 MB of data for free. You would pay $15 a month for same amount of talk, text, and data on a tracfone plan. That is a $180 a year. I like the fact that you can earn free bonus data by referring friends and completing offers. I liked the fact the they offer service on AT&T’s 4G LTE network. That network has very good coverage in the Metro Boston area, where I live. I like the fact that it doesn’t seem like they have set a max download speed like other services. Now there are some things I didn’t like. If you use an iPhone, FreedomPop doesn’t fully integrate with the built-in iPhone apps. You won’t be able to use the iPhone’s Phone or Contacts app to manage calls. You also won’t be able to use the iPhones’ Visual Voicemail, but FreedomPop does offer their own Visual Voicemail Service and App for $2.50 per month. You won’t be able to use the iPhone’s Messages app to manage all your messages. You have to use the FreedomPop app for SMS text messages and MMS picture messages. You still can use Messages for apple’s iMessage service with other people using Apple products. But this means you’ll need to use two different messaging apps. Further I was unable activate my FreedomPop phone number with iMessage, meaning other people would have to send messages to my email address for me to use iMessage. If you want to use MMS picture messages and group texts you’ll need to sign up for FreedomPop MMS and Group Messaging service for $2.00 per month. Now if your not an iPhone user, you may not understand, but iPhone users rely on the built in apps. Messages is one of the reasons that so many people stick the iPhone. It’s a big deal. The Phone app is important too but not as important as Messages. Also with FreedomPop you won’t be able to dial using your Contacts or any other app o that can make calls. This includes tapping on phone numbers on a web page in Safari. You also won’t be able to use Siri voice commands for calls and messages. The iPhone offers a unified integrated experience across the phone. You can’t change or customize core apps. With FreedomPop you are giving up a lot of that experience. With Android, you need still need to use the FreedomPop app for calls and messaging but the experience feels better to me. You can replace default apps. My phone was able to automatically able to launch the FreedomPop app to dial calls. I was also able to set FreedomPop as the default for messaging. Clearly this is one of the strengths of Android. While I found the the data speeds on FreedomPop’s LTE network to be fast the ping or response time was on the high side when I measured them. Moving on I’d say for me its been a bit challenging to describe and explain the FreedomPop service. The plans have a lot of options and when you sign up for the free trial its wasn’t clear to me what was included on the 1GB LTE Plan and what was a premium service. For example, it wasn’t clear to me that MMS picture messages and group texts are a premium service. When I did my review I was enrolled in a trial of the $8 FreedomPop Premium Plus service. That service bundles, MMS and group texts, Visual Voicemail, and roll over data. Next I want to mention that I found the freedompop.com a little hard to navigate when looking to change from the Premium Plan to the Free plan. I also figured out later I needed to also downgrade from the Premium service as well. Also far as I can tell there is no free voicemail option. If you want voicemail you’ll need to use the Visual Voicemail feature for $2.50 per month. If you don’t to pay for voicemail, you’ll want to make sure you disable your voicemail otherwise people can still leave you messages you won’t be able to hear. Ultimately I decided that even though I’ve really like the idea of their $20 Premium 1GB LTE Unlimited plan, I’m not going to transfer my personal number to FreedomPop. My primary phone is an iPhone 7 and I don’t want to give up iMessage and the other integrations I rely on. I so downgraded to the Basic LTE 200 Plan. Now your needs may be different. The tradeoffs for FreedomPop may be acceptable for you. With my current prepaid service I can’t use Apple’s Visual Voicemail. I don’t rely on VVM and was able to give that up. Others I have spoken with think not having VVM a deal breaker. What really matters is what’s important to you. Now that said, I keep a few phones around here for doing smartphonematters.com related stuff. And having FreedomPop to keep an extra phone active on a Free plan is awesome. I’m also considering switching over some family members with Android phones to FreedomPop. And I think if you have a phone that supports two SIM cards, you should definitely sign up for FreedomPop. You’ll have a second number and extra data you can use. If you need more data or service you can buy it. I think that is sort of a no brainer. With FreedomPop you can get free phone service and data which is very impressive. They also have some affordably priced premium plans if you want to use this as your primary phone service but you definitely want to understand how the service works with your phone as well as what is a free service and what is a premium service. For more details, check out my article on smartphonematters.com. I’ll continue to update that article with corrections and more information about FreedomPop as I use it more.